116 Pages. 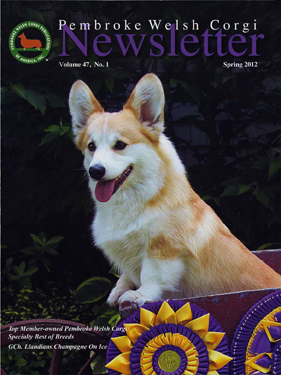 A single copy of the Spring 2012 issue of the PWC Newsletter featuring the 2011 Top Member-owned Pembroke Welsh Corgi and the 2011 Top Member-owned Pembroke Welsh Corgi: All Breed Points and the 2011 PWCCA Herding Trial. Specialty reports include the PWCCA Herding Trials, Lakeshore Pembroke Welsh Corgi Club, Palmetto Welsh Corgi Club and Sunshine Pembroke Welsh Corgi Club. Articles include The Winning Edge; an in depth look at the top member owned corgis for 2011 by Marian Your, The Magic of Corgis and Fairies, coverage of the PWCCA Meet the Breed booth in Orlando, by Betty Cook. Also in this issue is Part 3 of the Panel Discussion on Breeding Concerns, facilitated by Rebecca Lane. The Regional Talebearers features The Pembroke Welsh Corgi Club of Greater Atlanta with pictures, as well as the 2011 List of Annual Awards In Conformation compiled by Carol Schroeder and Janet Summer and the 2011 Photo Index compiled by Melissa Ericksen. Rounding out this issue is the Calendar of Events, PWCCA and PWCCPA Business information, Regular Editors Columns and color and b/w ads featuring PWCs.